There are so many spiritual lessons we can learn from Ezra, the scribe and priest. He rebuilt and restored the relationship of God's people to Yahweh. This is also our mission today. Ezra returned to Jerusalem from the Babylonian captivity 13 years before Nehemiah. To rebuild God's people in Jerusalem, the first order of business is to make sure the people understand God's Law. Ezra gathered the people of God to read the Law of the covenant to them. Before he began the reading, he led the Israelites in a short prayer ascribing blessing, honor and glory to Yahweh, the great God. This procedure is very important to prepare the hearts of the people to receive the Law. Notice the double intensity of the response: Amen, Amen. It's an expression of faith on the people's hearts to affirm that the great God be blessed. 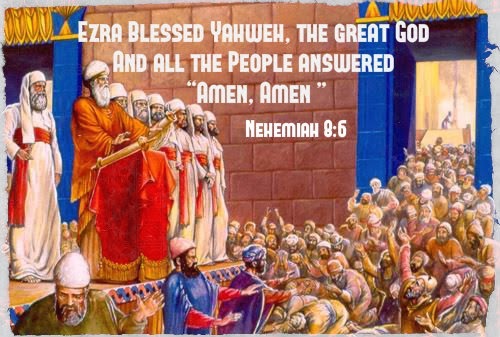 With hands lifted up, heads bowed, they worshiped Yahweh with their faces to the ground to receive the Torah. Today, we also must prepare our hearts in prayer and adoration as we hear the Word of God read and expounded. Reading of Scripture needs to play a primary role in our church worship. In the time of Ezra, people did not have their own personal copies of Torah, so they had to gather together to listen to the Torah read to them. Today, we take the Bible for granted for we have many personal copies of Scriptures. In our fast growing technologies, we do not even need to hold hard copies of the Bible anymore as we have many versions of the Scripture in digital format right at our finger tips. Everything is provided for us free and we do not know how to treasure the Scripture anymore. We need both the reading of Scripture and the correct exposition of the Word of God in our churches today. When I do my daily devotions, I often proceed in a quiet manner meditatively. I am now spending some time to worship and read out the portion of Scripture audibly in a reverent way. I find this very helpful to praise God and meditate more deeply on God's Word in my heart.